For Ryou's lineage, I guess his sister Youko (who is not later seen and I assume she was probably living on normally while he does all the fighting) must also possess the right to chi energy. So I guess if Ryou were disabled or not well, his sister Youko could take over his position. I was disturbed about Zydos' crumbling into dust instead of exploding or dying in an ordinary way. It's never specified to what happened to the real Zydos or whether or not it was an extension body. Perhaps it was to be made clear that Radiguet wasn't somebody you can easily mess with. I mean after all, she did foolishly try to kill Radiguet which she thought was the only thing she can do to atone for all the evil she did while she was Maria. I really thought that Radiguet showed just how brutal he can be with "If I can't have you, nobody will." So yeah, maybe it's to intensify the Ryu/Radiguet rivalry aside from her wanting to atone for all she did while she was brainwashed and crazy. Come on, does she have to indulge in so much self pity? Was the Ryu/Kaori Wedding in Jetman Just Totally Random? Well after I've done some entries related to Gai Yuki we do have the bitter fact that we are left with a really so random death. In fact, we do have the issue that some argued he didn't die (and I was on that side) while others said he did die. 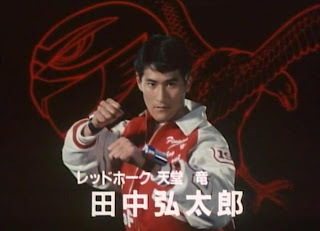 The Manga stated he died but it contradicted the events to the Jetman Encyclopedia which also stated that he died. 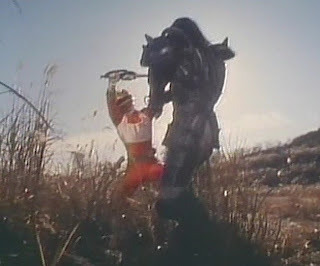 Buuba - Changeman featured the final battle between Change Dragon and Buuba. So Buuba chose to die on Earth rather than let Gozma face him. What better way to do so than to fight his rival Change Dragon to the last?What's so awesome about Buuba is that he not only rejected Gozma's cowardly ways but got to die at the hands of the strong plus he restored Shiima to her true self. Ley Wanda - He was killed by Red Flash in a one on one duel, this is one of Fantasy Leader's favorite duels of all time. 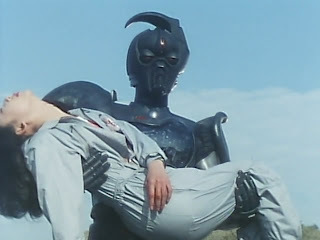 Baraba - In Maskman 48, after being pressured by Zeba to defeat the Maskmen or never return, he was eventually killed by Red Mask in a final duel after Oyobur refused to help him. Not having an extra ranger. 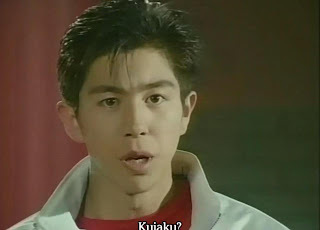 Extra rangers are fine but sometimes, I feel like extra rangers get too overrated since the arrival of my favorite Zyuranger, Burai. It would be nice to have some old school five-man team through and through. I would really want a third team composing of teenagers to save the world again. 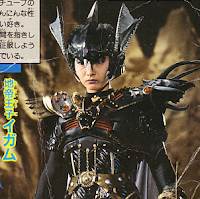 To be honest, I think most Super Sentai villains lack scariness. Basco was a refresher for some but he wasn't really that scary, he was more of the cool villain who's an annoying troll to the Gokaigers BUT he really lacks the scary factors that villains like Radiguet possess. 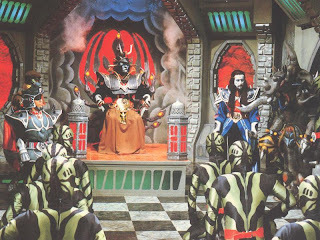 Villains like Zeba, Radiguet and Shaddam should make a return to Super Sentai somehow... that is real complete monsters. Well we should credit them as well huh? Happy father's day everyone! Emperor Aton is the father of Prince Megiddo. He really didn't care much about his son which led to his downfall. Doctor Man has a biological son named Shuichi and an artificial son called Prince who the audience may have thought was a human being at first. He struggled between his taking over the world and his son who cares about him very much. 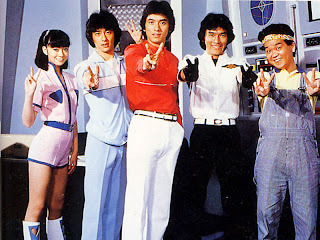 Gator in Changeman had a family. So glad he was able to reunite with them in the end after he betrayed Bazoo and became good. Futoshi Kijima/Goggle Yellow's estranged father appeared in episode 13. Shiro Gou/Red One's father was first seen in episodes 43-44 but it wasn't figured out but we do get a hint. Later, the mysterious man is revealed to be his father who is also Dr. Man's former friend. 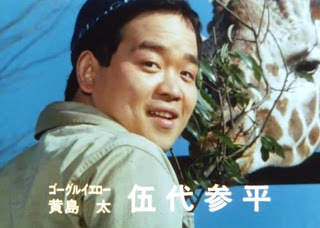 Sara Tokimura/Yellow Flash's father appeared late in the series. Too bad she could not stay home to be reunited with her family. Tears. Asuka- He is the father of Rije and then after recovering his wife Mahoro from her brainwashed and crazy state, had other unnamed children by her. For Maskman, as much as I love the series I have this plothole issue with Igam herself. So okay we do know why she was raised as a prince was because of the absence of a male heir (but they could have just forgotten about that whole male heir thing that is the family), however I had my thoughts while she masqueraded as a prince, it was her fierce loyalty to Zeba that bothered me too much since in the first place, Zeba usurped her parents' throne and KILLED them so why serve such a monster? So if she was after restoring the Igam family honor, why is she serving Zeba who in the first place dethroned her parents? It wasn't explained to why she serves Zeba so fiercely? Well I am afraid this season is pretty underrated... despite it not really entering into my "amazing list" but still, I feel this is a must watch. 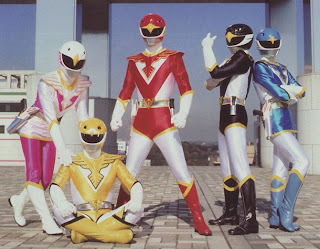 For me, I thought this whole season was filled wit concepts that would soon bring forth Super Sentai's newer ideas. There's a little bit of a shout-out for me. For example consider Goggle Red symbolizes Atlantis, Goggle Black symbolizes Asia, Goggle Blue symbolizes Egypt, Goggle Yellow symbolizes Lemuria and Goggle Pink symbolizes the Easter Island. I thought that the whole show was laced with a lot of gymnastic style fighting which really makes the fight scenes fun to watch.